I have been desperate for a pedicure for weeks now, maybe since the start of spring. The move from Dallas to Seattle not only took a toll on my emotions but also my feet. They have been screaming for pampering. Finally, I had to pull the trigger. I needed a pedicure, and I needed it NOW. Enter, the wonderful people of West Seattle to help me out. I posted a question on a Facebook group called West Seattle Giving Tree, asking where to get a good pedicure. And, boy, did the recommendations come rolling in! So many choices, so little time. The response gave me an idea! I have been so busy settling my family in the northwest, that my business (Bethany Siggins Image Consulting) has taken a back seat. I may not have many clients presently, but the least I can do is blog about my experiences in my new hometown! That said, let’s get on with my first review. Today I visited Day Nails and Spa (9444 35th Ave SW, just north of the intersection of 35th and Roxbury). It is a tidy little place with four pedicure chairs and two nail stations, along with a spa room for other services like waxing and eye lash extensions. I was the first customer of the day at 9:15 a.m. (they open at 9:00 a.m. Monday – Saturday). Tina was the only employee there, sweeping and getting the spa ship shape for the day. 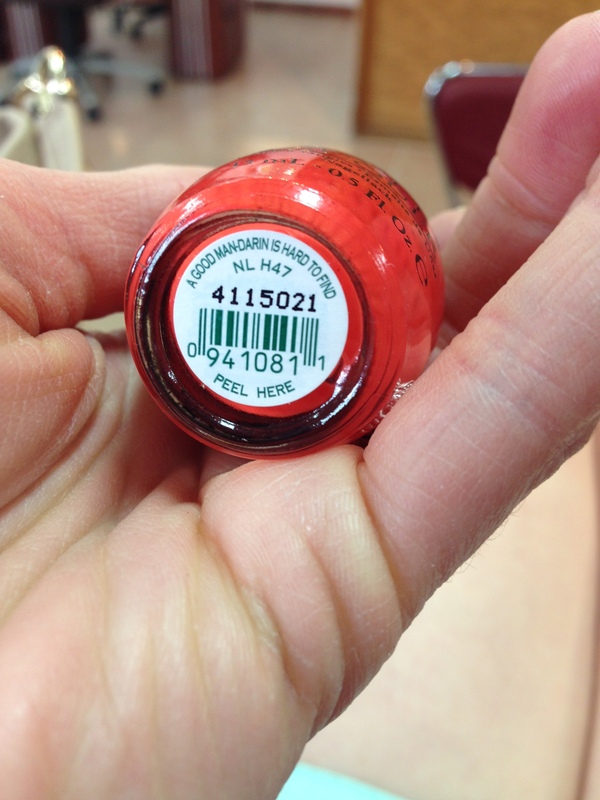 She directed me to the second chair after I chose my toenail color (OPI’s A Good Mandarin is Hard to Find, a fabulous orange that isn’t too bright). After establishing the service I wanted (a deluxe pedicure, competitively priced at just $30), Tina made me an iced Vietnamese coffee. Oh, how delicious! I noted the 70’s music playing on the speakers (not too loud). A little Earth Wind and Fire always makes me smile. Tina was very courteous, asking me my name and telling me hers. The pedicure started with a powder treatment in the water which she made sure was a temperature to my liking. The deluxe pedicure includes an exfoliating scrub of the feet and calves, along with a deep conditioning mask on the feet and calves, which she covered with warm towels for a short while. This was followed by the standard massage of the feet and calves, which was not rushed and just the right pressure. A little more than an hour later, I was on my way with very happy feet and a relaxed body thanks to the massage chair. All in all, I like this little shop, and I recommend you visit it for a change of pace from the larger, louder establishments. If possible, go in the morning when it is most quiet. I did not make a reservation; walk ins are welcome. On your 10th visit, you receive $10 off. By the way, a standard mani/pedi combo is also $30, a real bargain if you ask me. Give it a try and let me know what you think! Thanks for reading! And happy spaing!